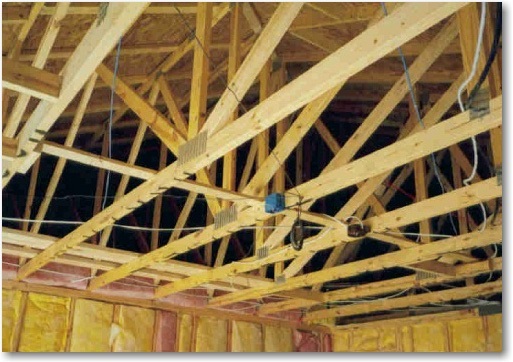 Ceiling Joists are used to support the ceiling surface materials. In a two story residential structure, the floor joists on the second level serve as framing for the ceiling on the first level. In this type of design, the floor joist span should include the ceiling weight requirements. On the roof level, the size and length of joists used for framing the ceiling depends on the design weight of the ceiling surface material (the dead load) and the weight of items stored in the attic (the live load). Typically, span tables for joists used to frame ceilings are figured for a combination live and dead load of 20 pounds per square foot (PSF). The size of the joists can be reduced by reducing the span. This can be done by positioning the joists on walls (in a given room) that are closer together, rather than on the walls that are further apart. You can also break up the span of joists by placing a beam under or between the spans. 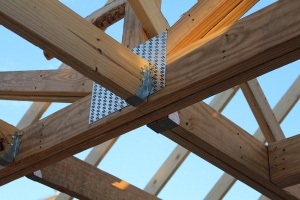 On the latter, you can use joist hangers to help support the weight of the end of each joist. In gable-type roof framing, it is generally desirable to put these joists parallel to the rafters so that they can be used to complete the triangle truss shape of the roof rafters. These joists are nailed to both the top plate of the wall, and the tails of the roof rafters.